NOTE: The controller configuration is a little wacky - make sure you configure your controls before playing (in the options menu). People Against Fascist is a game for 2-4 players created for #resistjam. In the game, one or more players play the role of fascists, and one or more play the role of "people" amongst the general population working to bring down the fascists. There is an "area of vision" around each fascist - and the only true representation of the world is visible inside that area. Outside of that area, all people look the same - the buildings always look as if the fascists have control - and it's impossible to see what is actually happening. The people must use this to their advantage as they move around the map liberating buildings. To do this - they should stand in front of the building and tap the "Sabotage/Repair" button. Once they have a sufficient level of control a window smashing sound will trigger indicating that the building has changed control. The fascists will not know which building it is until they go look. If the people control 6 of the 8 buildings at any point, they win. The fascists must work to stop this happening. The major tool they have at their disposal is imprisonment. Fascist can walk up to anyone and press the "Arrest/Escape" button to pick them up. They can then drop them in the prison (by pressing the "Cancel" button) to imprison them. While holding, if the person struggles (by tapping "Arrest/Escape") it's possible they will break free - tap "Arrest/Escape" to avoid this. People in the prison can not act until released from prison (either by the prison being liberated or by the fascists carrying them out). Once all "people" are imprisoned - or if the timer elapses without a "people" victory - fascists win. The primary goal of the fascists is to identify the rebels amongst the population - the primary goal of the people is to liberate enough of the city to take control. Rebels should aim to act in such a way that the fascist can not identify them. 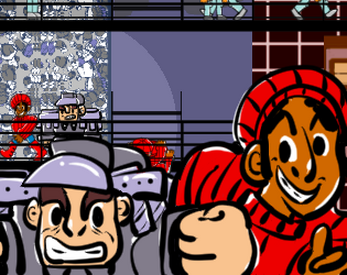 Code by Citizen Of Melee, Art by Jivechameleon, Music and Sound by Ingo Duarte. There are a number of things which did not get implemented due to time limits during a gamejam. These include different appearances for people, more actions for NPCs, additional interactive buildings (such as deportation via the airport), a way for fascists to retake buildings, and powerups both for fascists and people. These may be revisited in a future game.